On Monday night, President Trump announced a new strategy for Afghanistan, where American forces have been fighting since late 2001. 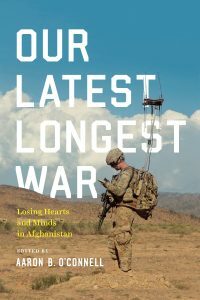 He gave few details, but the general indication was that the war would go on–with possibly as many as 4,000 additional troops–and that the strategy wouldn’t differ markedly from those followed by the Bush and Obama administrations. Nobody thinks 5,000 more troops is going to end the war in Afghanistan. For context, we have about 8,400 American troops there now. And at the height of the surge in 2011, we had 100,000. So adding 5,000 more won’t end the war. The hope is that it will buy the Afghan government a bit more time to bring the Taliban to a negotiated peace, or at least to halt the loss of momentum and halt the Taliban advance. . . . And so I think the American people would like very much to hear something we have not heard yet from this administration, which is a diplomatic strategy to end the conflict. We don’t make peace with our friends. We make peace with our enemies. And I think, thus far, in the first six months of this administration, what we’ve seen diplomatically out of the Trump administration borders on strategic malpractice. In 2011, U.S. Marine Lieutenant Colonel Aaron O’Connell finished a tour of duty in Afghanistan. He’s had a lot of time since then, year after year, to think about why that war continues. AARON B. O’CONNELL: There seem to be a lot of parallels to the way we fought Vietnam. INSKEEP: Vietnam, which was America’s longest war until 9/11. Aaron O’Connell is not the first person ever to make that comparison. In fact, the specter of Vietnam is loomed over every U.S. military intervention since. But that is exactly what got Aaron O’Connell thinking, how could this be happening again? O’CONNELL: I was surprised by that, particularly since the people who had written the counterinsurgency manual were steeped in the lessons of Vietnam. They weren’t – we didn’t forget Vietnam. We didn’t ignore Vietnam. The people who wrote our tactics for Iraq and Afghanistan were scholars of the Vietnam War. They were men who had written Ph.D. dissertations on the war in Vietnam. And yet, we repeated the errors over and over again. Our latest longest war continues.